Are you tired of shoveling snow to clear your walk and driveway and to get your car out? Have you been hit by a surprise snowstorm and been caught unprepared? Are you tired of paying snow-removal companies for services that leave you cold? Are you concerned about health issues with winter clean-up? 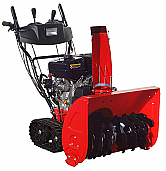 Then you should consider a SNOPRO SXP1128PRO snow blower with tracks. Not only are SNOPRO products built for the toughest weather, these products will save you time, effort, money and from possible injury or worse. So, why shovel after a snowstorm when you don’t have to? There’s never been a better time to take advantage of our fantastic deals on snowblowers! 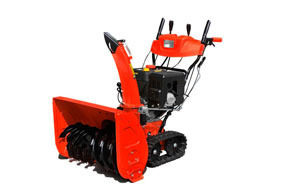 The latest SnoPro® SXP-1128-PRO is a commercial grade machine, comprising German-design ingenuity and parts, built for heavy duty use in extreme conditions. Ahead of its class with power and durability to spare, you’ll love the effortless and reliable start-up, the easy use and durable, tough construction. The latest SnoPro® SXP-1328-PRO is a commercial grade machine, comprising German-design ingenuity and parts, and built for the most extreme weather conditions. Ahead of its class with power and durability to spare, you’ll love the effortless start-up and maneuverability of our most reliable and rugged snow-thrower yet.